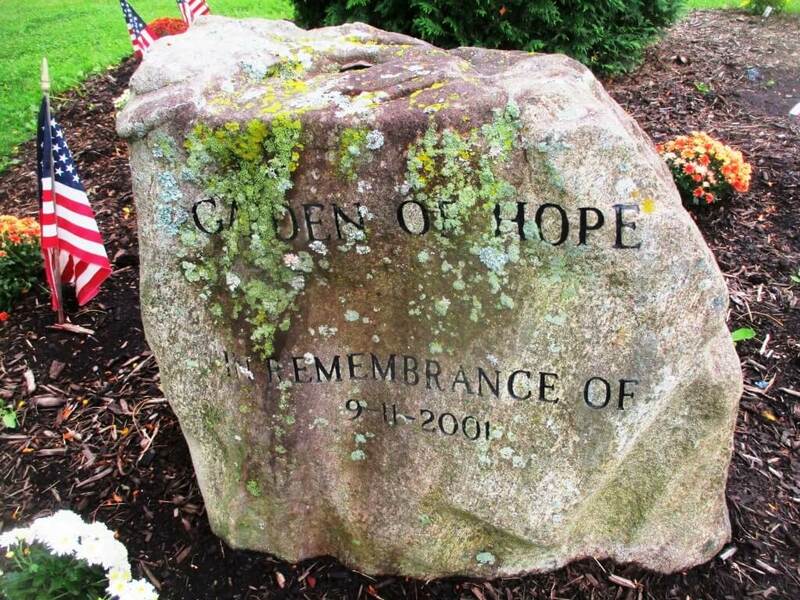 Every 9/11 anniversary it is fitting to visit the Remembrance Stone in the Garden of Hope next to the Twelve Corners Middle School in Brighton on Elmwood and Monroe Avenues. As for many around the world, the men and women jumpers, hand in hand, stay in the mind’s eye. With smoke dilated eyes beyond thirty packs of cigarettes and your back a thousand times hotter than the worst sunburn, who do you choose? Is it the co-worker you’ve known for years in the next cubicle? Is it random, simply the person next to the window? Does it matter? One human to another. Almost invariably it was men and women clasping — even if strangers. Some primal need in the last seconds of existence to recreate the human family? And thinking, what will my own family feel? Today, we reprint our 2017 9/11 story. 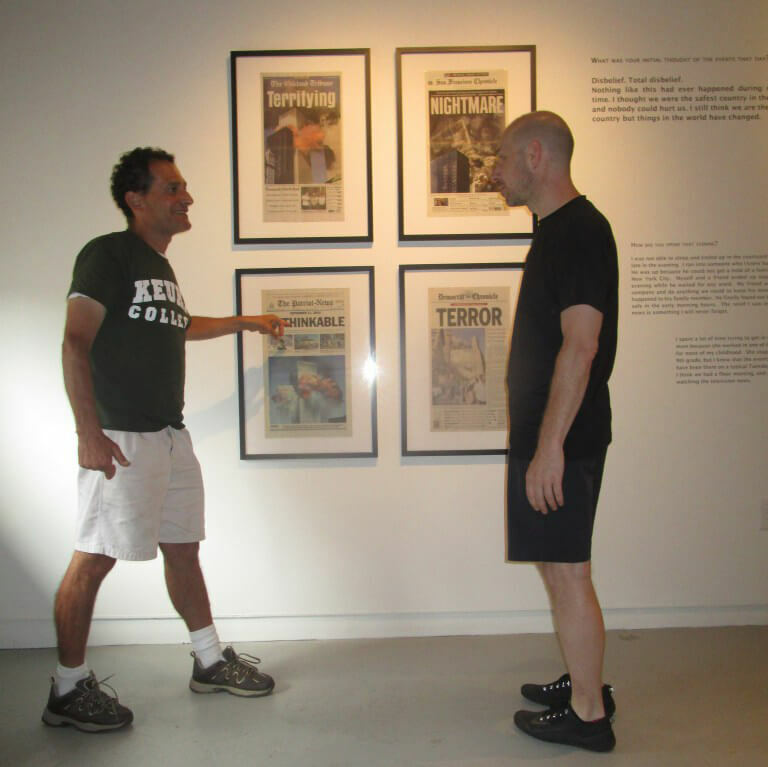 On September 11th, 2001 when the towers fell, I was driving on 95 north from Shannock, Rhode Island to Providence’s Armory District to see an available apartment in the house where my friend Joe Volpe lived. We were both graduate students at the University of Rhode Island. Not having heard the news in Shannock, on the radio I learned the first tower had fallen and the second on fire. A metaphor-laden moment. 180 miles away the United States had been attacked, but driving north we were isolated citizens not readily able to communicate with each other. A metaphor for the collective inhabitation of the public sphere in which individual members — in war and peace — often only interact through information technology. I wondered how many in the cars around me knew and were also listening on their radios. It seemed the other drivers looked intent and still, but I could not know for sure. Were we supposed to gesture or honk our horns? Turn on your radio! 6 years before the release of the first generation iPhone, most were probably not getting calls or texts. When I arrived in Providence, the second tower had fallen. Joe — now glued to the tv screen — had only heard when his landlady had called to cancel the appointment, worriedly waiting for news from her friends in Manhattan. A couple of hours later back at the URI campus in Kingston, I learned that classes had not been cancelled. My colleagues in Writing 101 classes had told their students to freewrite their impressions of the event. A black and white tv was set up in the lounge where media theorist Professor John Leo was already processing the waves of rhetoric bombarding us. That night hundreds went to a vigil in Keeney Auditorium. This afternoon before the First Friday opening of A 9/11 Project: reflections and memories fifteen years later, I met Eric T. Kunsman, Lecturer in NTID’s Visual Communication Studies and Michael Riordan, Program Chair of the Media Arts and Technology BS at RIT’s Metro Art Space, Gallery R on 100 College Avenue. 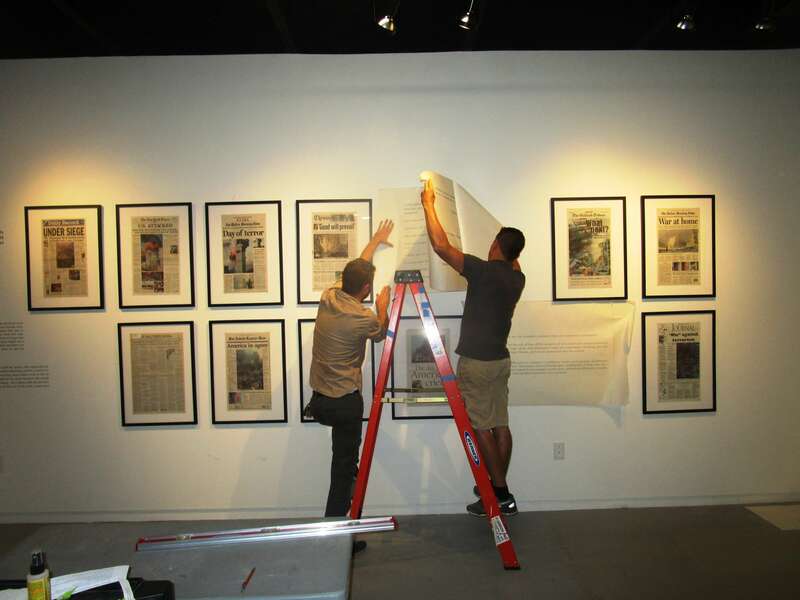 The premise for A 9/11 Project: Reflections and Memories — a multi-part exhibition showcasing a selection from 121 newspapers collected in the week following 9/11 along with contemporary reflections from RIT students and the Rochester community — stems from Eric’s Applied Photo Art I class from September 11, 2001. That morning, on his way to RIT after the towers had collapsed, Eric stopped for gas, noticing a stack of the day’s papers (not containing, of course, the news of the tragedy). 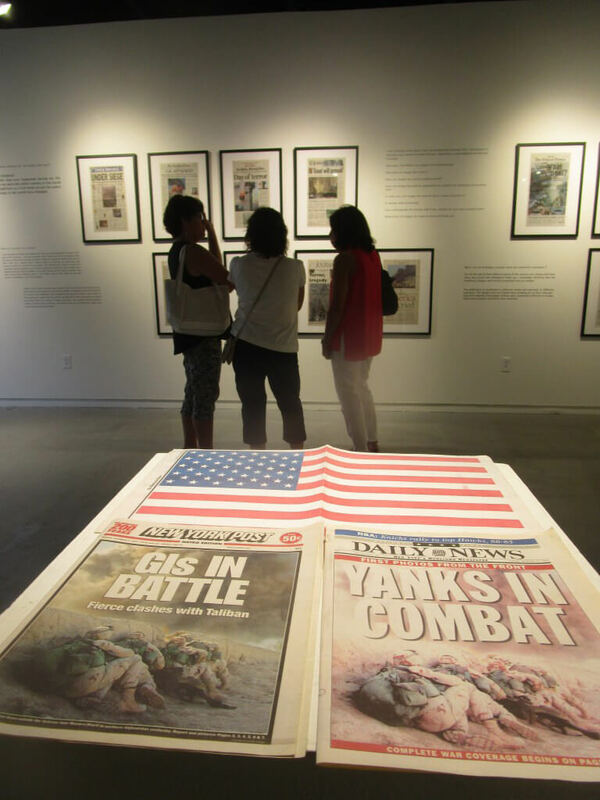 The newspapers made Eric realize how much the events of 9/11 would make history, and in turn, how photography and videography would shape and influence the opinions of events for future generations. Seizing the teachable moment, Eric adapted the planned curriculum. 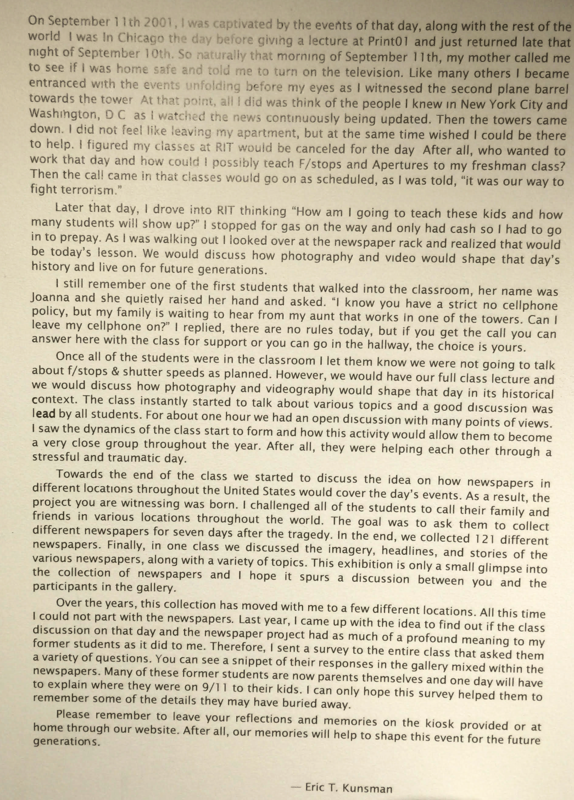 Instead, Eric created an assignment in which students asked friends and family to collect their hometown newspapers. Three weeks later, the class spread out the 121 unique newspapers, begining a discussion of the different representations of the photographs, headlines, and articles. 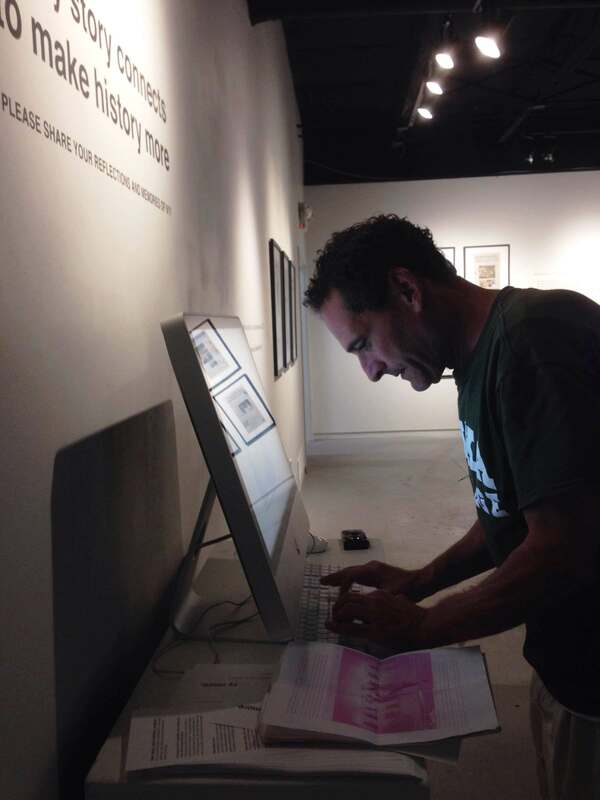 Eric said these teaching moments — shelving pre-planned curriculum, improvising, creating, making the course material real and relevant — were the most satisfying of his career. 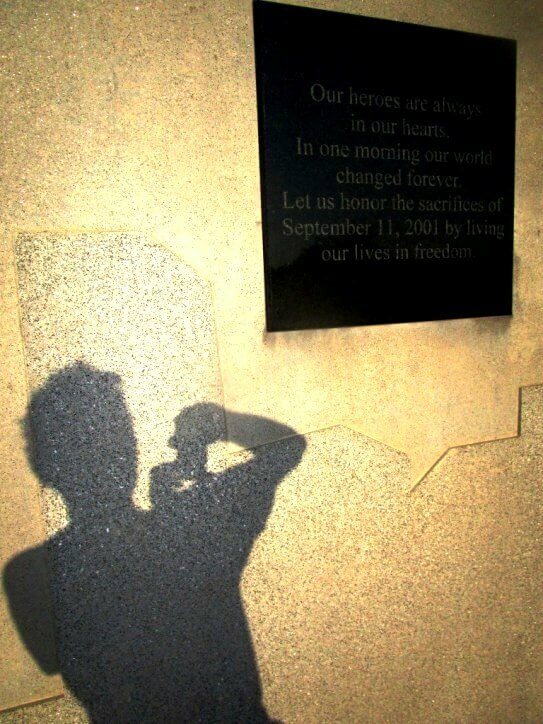 And the moments reminded Eric it need not take a 9/11 to make the classroom or lecture hall a living laboratory. Fifteen years later, Eric reached back out to these students to see what they remember from that discussion and the project. 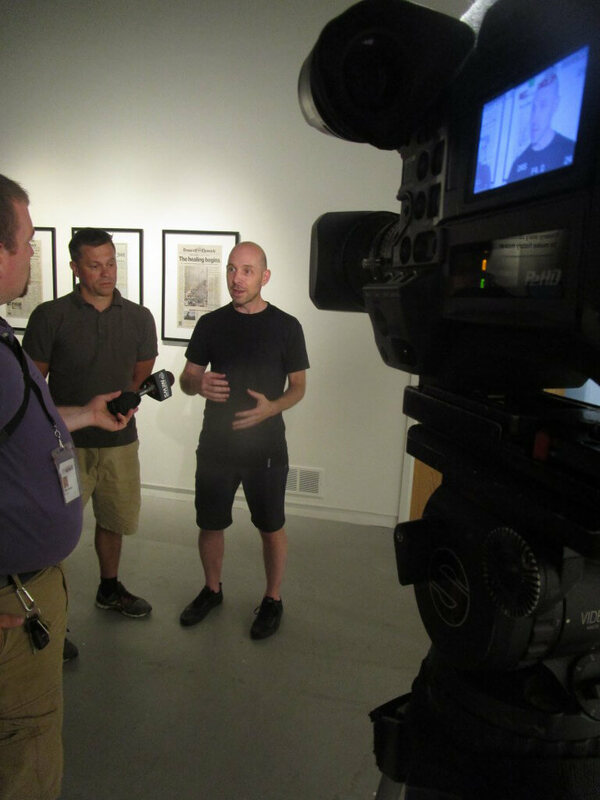 In addition, one component of the exhibition engages members of the Rochester community directly by encouraging them to share their own reflections of 9/11 and how it impacted them. When the lecture ended, the class moved to the lab where a student worker had already set the big screens to CNN.com. Like Eric, other RIT faculty, and my writing colleagues at URI, Michael dropped his prepared instruction to open a discussion about history in the making the class was watching live. Michael, who leads this portion of the exhibit, had also been teaching the morning of 9/11: a lecture and a lab for Color Separation Systems. Actually, the first visitor of the night was Jane who had been in Michael’s class 15 years ago. Hearing of the opening on facebook, Jane made Gallery R her first First Friday stop. 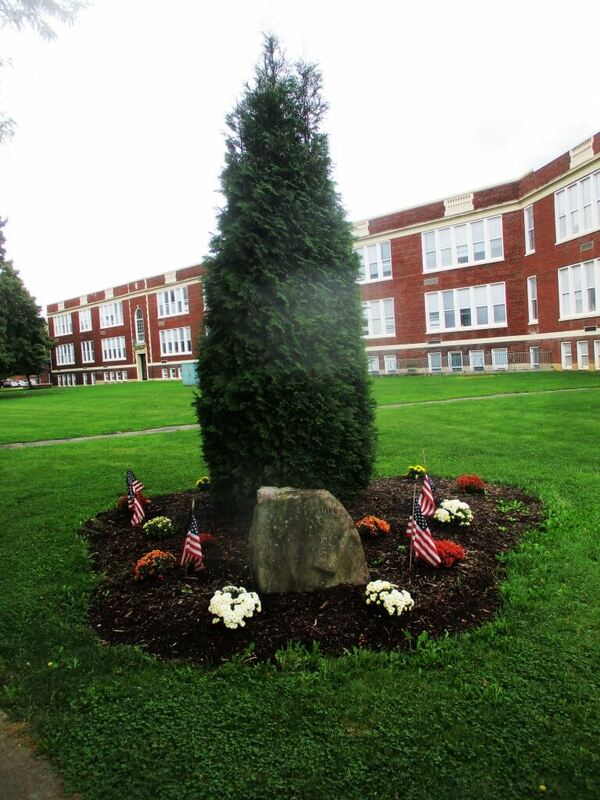 Pinnacle moments like the events of 9/11 provide an important touchstone for us all. 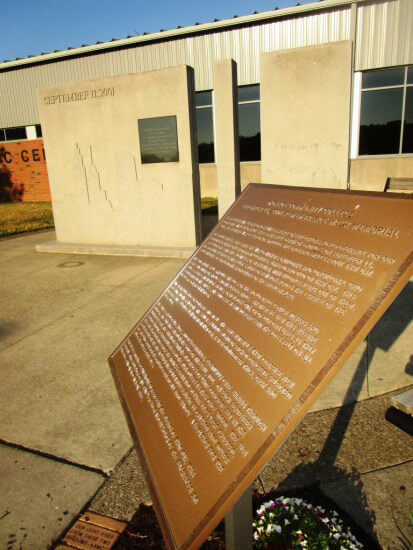 Hopefully, this collective memory of 9/11 from the Rochester community will provide insight on how we connect both as individuals and as a community. The legacy component is important as well. When you consider that 2016’s incoming college freshman were only three years old when 9/11 occurred, how quickly time passes becomes clear, and the value of reflecting and sharing more evident. Is it Immoral to Watch the NFL?